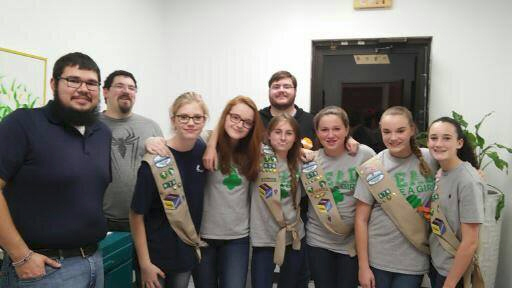 Roderick Peña (left, Videographer), Jeremy Williams (center, Production Assistant), Chris Johnson (right, Audio Engineer) with Girl Scout Troop 676 members Grace, Annabelle, Cecelie, Zoe, Sophia, and Hayden on location at Squash Blossom Studios. "Meet Henri," Girl Scout Cecelie with Henri preparing to make a video to help Henri find a home. New videos from Squash Blossom Studios help overlooked kitties find homes. Karen Fling, DVM, owner of East Lake Veterinary Hospital and president of East Lake Pet Orphanage (ELPO) in Dallas announced Squash Blossom Studios has just released a series of seven videos filmed at their recently completed recording studio aimed at finding homes for a group of overlooked kitties at ELPO. Dallas Girl Scout Troop 676 members Kathrin, Grace, Cecilia, and Zoe shared their time and talent by writing and recording original stories of life from the feline point of view for cats at ELPO who have been overlooked in the adoption process. Some of these cats lost their homes when their owners died, and some were rescued from life on the streets. The cats tell their ages– ranging from a few months to 13 years, and their life stories through the girl’s voices. “We just built this recording studio, and this is our first project,” said Dr. Fling. The cats featured were largely the least adoptable, most overlooked cats. Some have been with us the more than 2 years - too long for any cat to live in a cage. “The girls were so excited to be a part of the recording process, and In between recordings and selfies they were seen frequently jumping up and down squealing ‘this is so cool!’ The girls felt like recording stars at the end of the day, and the cats seemed to recognize that they were special too. “The project utilized slow motion video of the cats that allows the viewer to appreciate each animal’s beauty. The Girl Scouts spent time in advance of the recording project getting to know and understand the cats so that they could best describe each one. They used their creative writing skills in writing the cats’ stories, describing their histories, temperament, and the sorts of homes they would fit into best. The Scouts performed and recorded voiceovers. The result really showcases each cat’s personality. We plan to share the videos through social media to create awareness and help more long-term orphaned cats to be adopted. The 18,000 square foot warehouse facility currently has 8,000 square feet of air conditioned, finished out space available for use. The facility includes 16’ ceilings and garage style opening doors with loading dock height bays. East Lake Veterinary Hospital offers state-of-the-art treatment and surgical facilities, a full-service grooming area, and luxurious boarding accommodations, managed by a compassionate and caring team of nearly 70 doctors and staff–all of whom truly love animals. Since its founding in 1993, East Lake and its vets have been recognized repeatedly as the best-of-the-best in Dallas. The practice was chosen as the "best vet for overprotective pet parents" by the Dallas Observer. The hospital itself has received the Hospital Design Award and Practice of Excellence Award given by the Veterinary Medical Publishing Group. The Texas Veterinary Medical Association has recognized Dr. Fling both as an outstanding practitioner and for her exemplary work in community education programs related to proper animal health care. Additionally, Dr. Fling has been voted Dallas’ "best vet" on multiple occasions by D Magazine. In addition to the hospital, East Lake also operates the East Lake Pet Orphanage, dedicated to giving deserving animals a second chance to find permanent homes. A no-kill facility, ELPO has found happy homes for thousands of pets since its founding in 2001. To learn more about East Lake Veterinary Hospital, visit http://www.welovepets.net or call 214-342-3100. To learn more about East Lake Pet Orphanage, visit http://www.elpo.org or call 214-349-3576. East Lake Cat Care Center is approved by the American Association of Feline Practitioners (AAFP) as a Cat Friendly Practice (CFP) at the Gold Status level. Karen Fling, DVM, opened the East Lake Cat Care Center in November 2013. The East Lake Cat Care Center is a stand-alone facility built to cater to everything ‘cat.’ From comprehensive medical care to our ‘home away from home’ bedroom lodging suites.